6 Broadcaster Press January 1, 2019 www.broadcasteronline.com SDDA Launches New State Burn Permit System Lutherans Outdoors In South Dakota Announces New Executive Director RAPID CITY S.D. — The South Dakota Department of Dakota Wildland Fire webpage. Agriculture’s Wildland Fire Division has launched a new and This new site is mobile friendly and is part of the Diviimproved burn permit website that is more user friendly. sion’s effort to move to an online permitting system. For the The new site will require all users to have a valid email remainder of the season, the public can still call in during address and register as a new user. Any permit that has business hours to obtain a burn permit or ask for direction already been issued for this burn season has been transin obtaining their own permit online. ferred to the new system and is still valid. Numbers to call for assistance with burn permits are: The new site can be found at https://apps.sd.gov/AGLawrence County at 605.584.2300; Meade and Pennington 73BurnPermit/Windows/Login.aspx or by going to the South Counties at 605.394.2582; Custer and Fall River Counties at Dakota Wildland Fire webpage, https://wildlandfire.sd.gov/, 605.745.5820 or 1.800.275.4955. and clicking on the link in the Quick Links box. 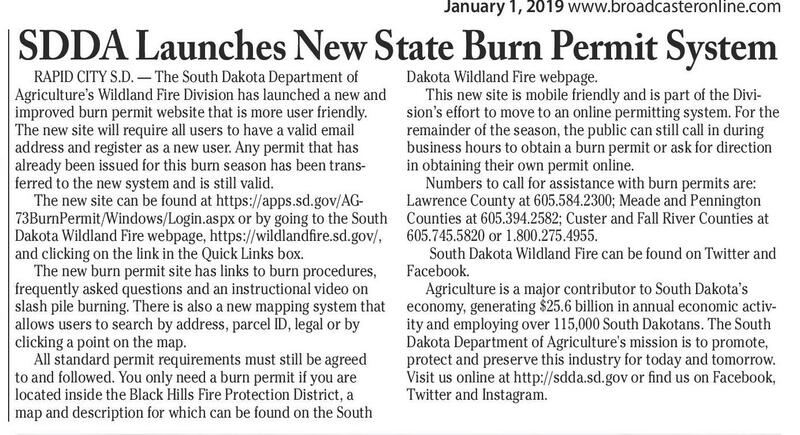 South Dakota Wildland Fire can be found on Twitter and The new burn permit site has links to burn procedures, Facebook. frequently asked questions and an instructional video on Agriculture is a major contributor to South Dakota’s Sioux Falls, SD ~ Lutheran Outdoors is pleased to an- slash pile burning. There is also a new mapping system that economy, generating $25.6 billion in annual economic activnounce Paul Hanson has accepted the executive director allows users to search by address, parcel ID, legal or by ity and employing over 115,000 South Dakotans. The South role, effective January 1, 2019. Hanson, who has served clicking a point on the map. Dakota Department of Agriculture's mission is to promote, as acting executive director since May 2018, joined the All standard permit requirements must still be agreed protect and preserve this industry for today and tomorrow. LO team in October 2015 as business and operations to and followed. You only need a burn permit if you are Visit us online at http://sdda.sd.gov or find us on Facebook, director. Hanson is no stranger to camping ministry located inside the Black Hills Fire Protection District, a Twitter and Instagram. serving in leadership roles at various camping ministry map and description for which can be found on the South organizations for the last 26 years. Hanson was chosen from a field of 10 applicants by a search committee made up of LO board members. “As a search committee, we were looking for an executive director who could lead our ministry into the future as the industry is changing and facing many new challenges,” explained Christina Nath, LO board chair. “Paul not only understands how to lead and manage the many, many parts of a multi-site camping ministry, he also has a passion and commitment to see LO achieve our goal of and a Winning Personality welcoming all to explore experience Christ’s love and in creation and community.” The key qualities the search committee focused on included: • Excellent communications skills, including the ability to bring together staff from multiple sites around a single mission • Fiscal responsibility with a focus not on just the whole, but each camp individually working with the directors to develop opportunities and support • Relationship building among staff, camp communities, ministry partners, ELCA congregations and Synod • Innovation and initiative and a willingness to step out and take risks for the greater good of all In addition to serving as acting director of LO, Paul recently stepped up to provide leadership for Joy Ranch, which has allowed him to learn the unique needs and challenges of a camp designed to welcome all abilities. “Paul jumped in with both feet, spending a great deal of time getting to know the staff, community and supCall 624-4429 today to get your ad in the Broadcaster Press. porters,” said Nath. “He is fully aware of the challenges Our graphic design staff will create a unique, personalized ad we are currently facing and will hit the ground running that will help your business stand out from the crowd! as we develop strategies and initiatives to ensure our 201 W Cherry, Vermillion • Fax: 624-2696 • BroadcasterOnline.com future success.” Color, Style, Broadcaster Press 1320 Sacred Heart School Full or Part-time K-8 Spanish, 5-8 Computers Contact Laura Haberman 605-661-1893 or laura.m.haberman@k12. 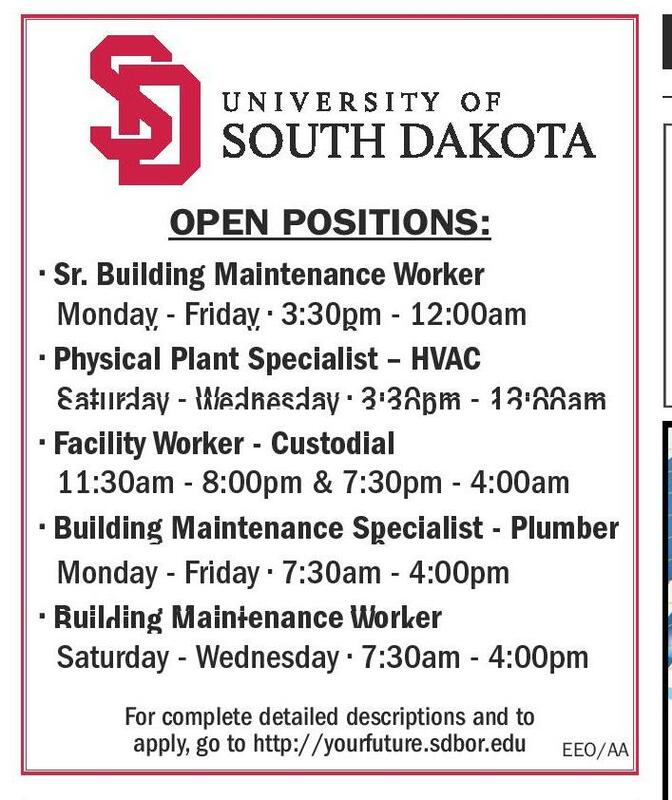 sd.us www.yanktonsacredheartschool.org Open pOsitiOns: • Sr. Building Maintenance Worker Monday - Friday • 3:30pm - 12:00am • Physical Plant Specialist – HVAC Saturday - Wednesday • 3:30pm - 12:00am • Facility Worker - Custodial 11:30am - 8:00pm & 7:30pm - 4:00am • Building Maintenance Specialist - Plumber Monday - Friday • 7:30am - 4:00pm • Building Maintenance Worker Saturday - Wednesday • 7:30am - 4:00pm Are you looking for a new career? For complete detailed descriptions and to apply, go to http://yourfuture.sdbor.edu EEO/AA Utility Clerk Salary: starting at $14.01/hr. plus benefits. Responsibilities include: Greet and assist utility customers, answer phones, receiving payments for licenses, permits, utility billing and other city revenues, daily balancing, monthly utility billing preparation and routine bookkeeping. Requires HS diploma or equivalent, good communication skills, ability to operate Windows/Office based PC. Position is open until filled, review of applications will begin January 4, 2019. A position description and an application for employment can be found at www.vermillion.us/careers. 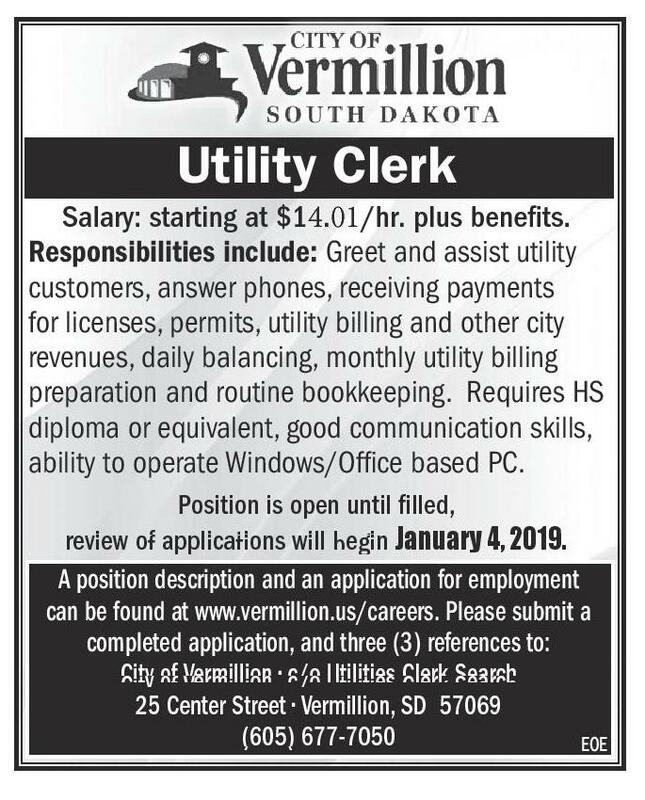 Please submit a completed application, and three (3) references to: City of Vermillion • c/o Utilities Clerk Search 25 Center Street • Vermillion, SD 57069 (605) 677-7050 EOE bp Since 1934 Education Broadcaster Press 201 W. Cherry, Vermillion 605-624-4429 For a challenging and rewarding career. JOIN OUR TEAM! is hiring: • Welder/fabricator ($1000 sign-on bonus*) • Tool Room Machinist ($500 sign-on bonus*) • Manufacturing Assembler ($500 sign-on bonus*) • Saw Operator ($500 sign-on bonus*) • Industrial Electrician ($500 sign-on bonus*) • Industrial Painter ($500 sign-on bonus*) • Hydraulic System Design Engineer • Design Engineer ? Competitive Wages ? State-of-the-art facility ? GREAT benefits ? Profit Sharing ? 401k and matching d an on-line A job description an und at fo application can be contact om or www.masabainc.c 8928. Wendy at 605-658- 1360 Income Opportunity Are you a Class A CDL Driver and tired of getting jacked around by employers? Call me to see why our turnover rate is so low. Scott 507-437-9905 Apply: WWW.MCFGTL.COM (MCN) Become a Published Author. We want to Read Your Book! Dorrance Publishing-Trusted by Authors Since 1920. Book manuscript submissions currently being reviewed. Comprehensive Services: Consultation, Production, Promotion and Distribution. Call for Your Free Author's Guide 1-855520-9045 (MCN) NEW AUTHORS WANTED! Page Publishing will help you self-publish your own book. FREE author submission kit! Limited offer! Why wait? Call now: 855-623-8796 (MCN) Seeking a trustworthy, organized and reliable person to clean my home in Crofton, NE. Please call after 4pm. 605-661-1878. 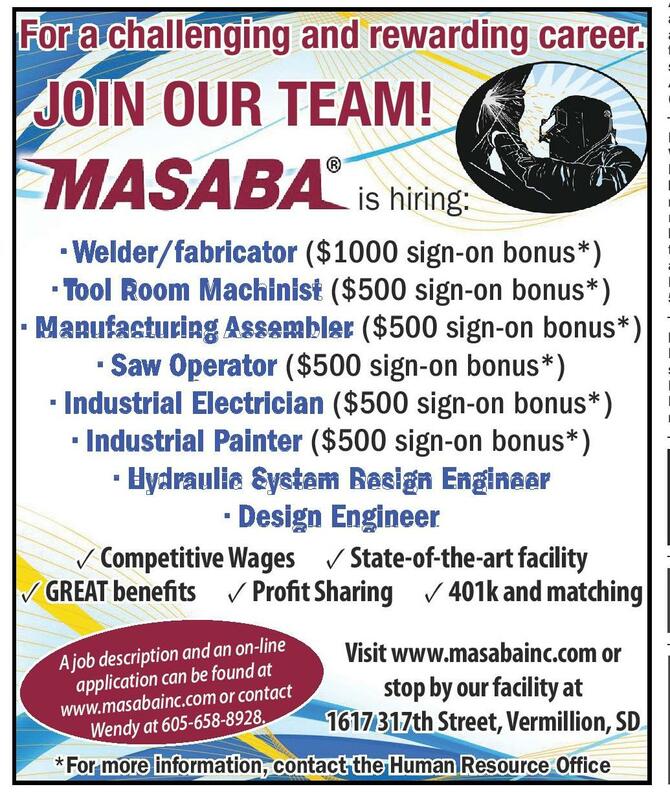 Visit www.masabainc.com or stop by our facility at 1617 317th Street, Vermillion, SD *For more information, contact the Human Resource Office If you don’t get the word out about your business, no one else will!! !